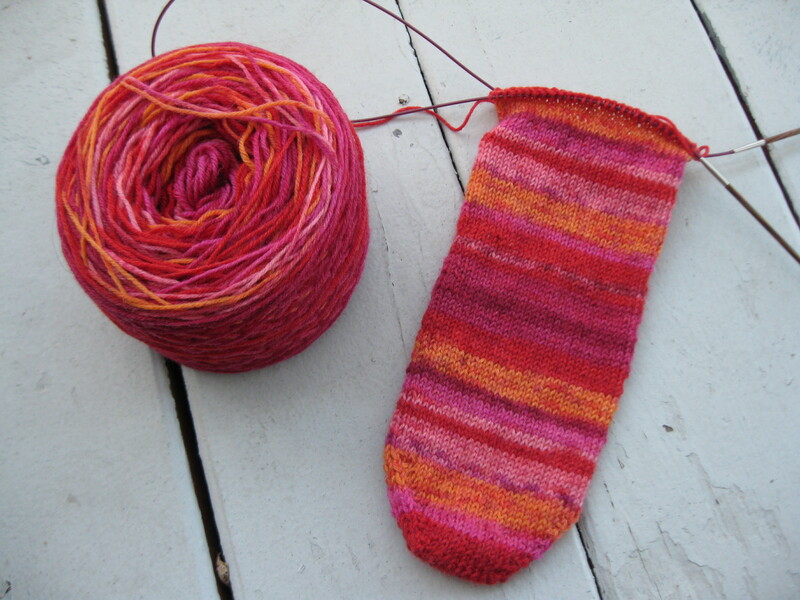 Lion Brand Yarn Sock-Ease. The name of this colorway is Red Hots. Once in a while I will show up for work on a Friday morning and discover that I am the only clinician working that day on the yard, because everyone else is either off or called in sick. Today was one of those days. Today was also one of those days where it seemed like I kept getting phone calls and referrals to evaluate one inmate or another. One of those inmates turned out to be in such bad shape that I knew I couldn’t release him back to the yard. My Spidey sense told me that this guy needed to be admitted into the inpatient psychiatric hospital pronto, particularly since he’d already tried to end his life several times before and had the scars to show for it. So it was a busy day, which made the ten hours go by quickly. The good news is that now I’m looking at another three-day weekend, hooray! Tomorrow I am attending an all-day free-motion quilting class for beginners. I signed up for this class some time ago, and I’m looking forward to it. I’ll let you know how it goes. Stay tuned. Categories: Handmade, Work (My Day Job) | Tags: knitting, prison, socks | Permalink.